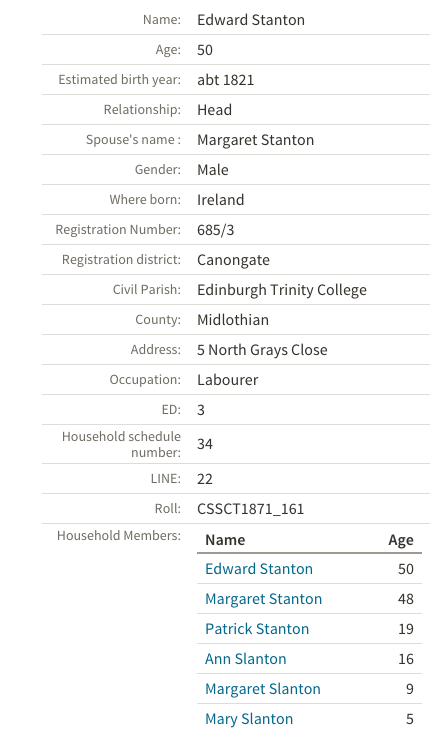 Our direct line Edward Stanton born 1817 and Margaret or Peggy Grady born the same year or thereabouts. Edward Stanton was the son of Walter Stanton and Honor Green. The family resided in the town of Westport or neighbouring village and they would have had many children. Edward however is our direct line and he married Margaret Grady on 19th January 1944 in the Oughavel RC Parish in Westport in County Mayo. Witnesses were Patrick Grady [brother of Honor] and Maria Stanton [sister of Edward]. Walter was a crofter and we estimate his birth 1780-1790 or thereabouts. Peggy Grady’s parents were Patrick Grady and Annie McGuire. There were a few branches of this particular family who landed on our shores and who settled in the Edinburgh of the 1850s. Edward arrived as did cousins with the same name and their children all had the same names. Confusing indeed. 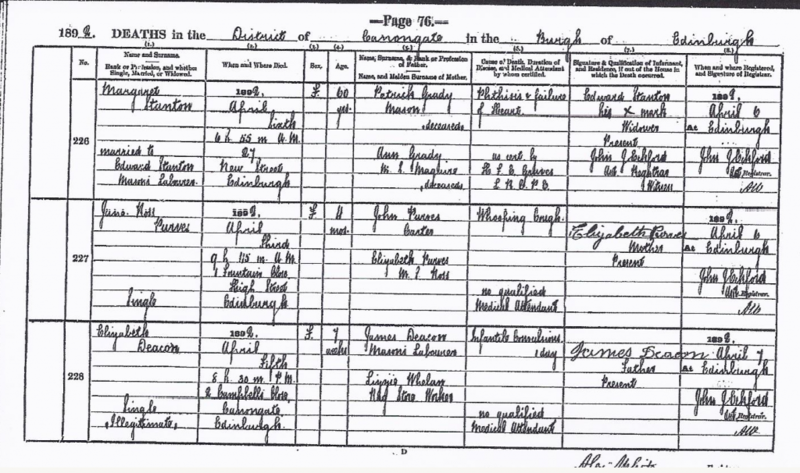 On their arrival in Edinburgh with their son Andrew Edward and Margaret found themselves amongst the Irish and Italian community in the Grassmarket, Cowgate and High Street areas of the City. At this time in Edinburgh there were thousands and thousands of Immigrants arriving escaping famine not only from abroad but also from the North of Scotland with the infamous Highland Clearances. 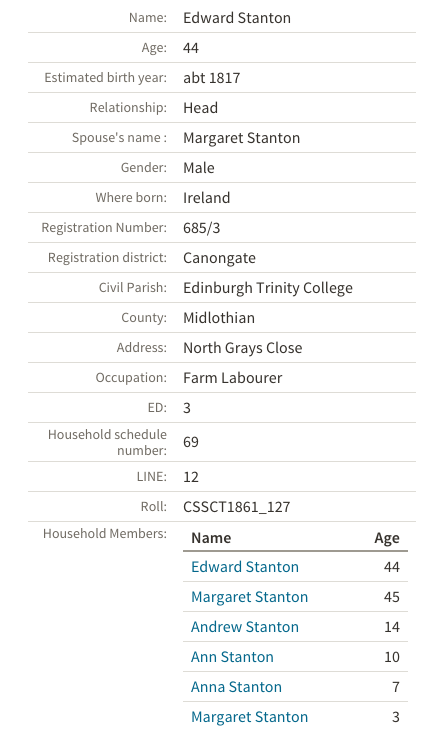 The Stanton family were farmers in Ireland and it must have been very difficult at first for Edward to find work. They found a wee house in 5 North Gray’s Close and we find them here in the census of 1861. 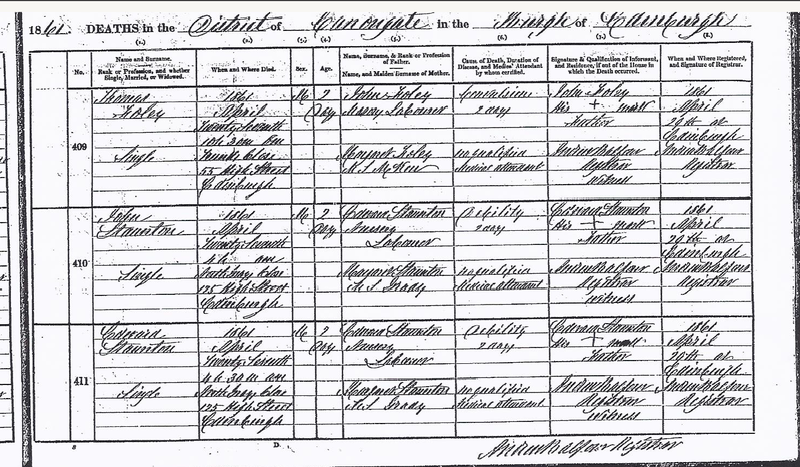 1861 with four of their children, Andrew, Ann, Anna and Margaret. There were twin boys born in April 1961 but both died 2 days. 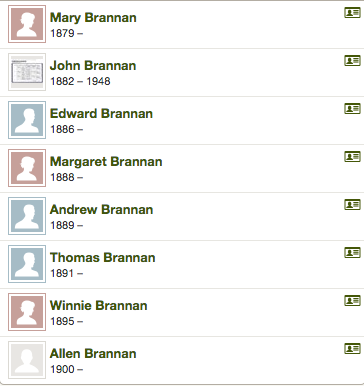 Stanton Brannan marriage in St. Pats. Margaret died when she was only 37.